You recall the name Caanan Grall, yes? Creator of Zuda winner (how much longer will that be a thing?) Celadore? Eisner-nominated Max Overacts? Good? Good. 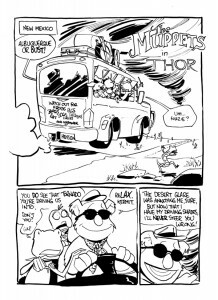 Then all you need to know is that Grall participated in the 24-hour Challenge this year and the product was a Thor/Muppets mash-up comic. If you haven’t clicked yet, then you probably won’t because you hate good things. This entry was posted in News and tagged caanan grall, celadore, max overacts, muppets, thor by The_Best_Jason. Bookmark the permalink.